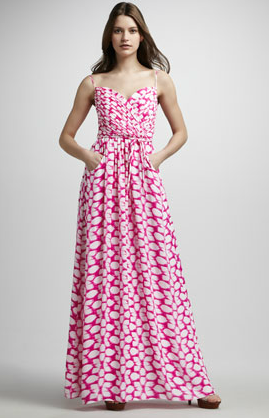 Last week I was reading Audrey’s post on what to wear to a summer wedding and I was instantly smitten with this Shoshanna Maxi dress. I pinned it right away and only later gasped at noticed the price of $580. I mean the dress is pretty, but that is a weekend away with my husband. What I loved about this dress was the neckline and the pockets. Pockets!! Anytime a dress has pockets, I am pretty much sold. So I was on the hunt for something affordable. I found 3 really cute options for $50 or less. Score! I am still deciding between the three, but right now I am drawn to the blue one….and the striped one…but then the black one has that neckline…hmmmm. Have you found a great dress lately? Those are cute. I cannot imagine paying those prices for a dress. Your options are great. love that striped number! cuuuute. This is perfect! I have *several* maxi dresses, but I’m starting to get that “I wear this too much” feeling! Thanks so much, Andrea! Pockets seal the deal for me too!!! I have this incredible high to low jersey dress that has pockets and I literally go to grab it weekly! Oh I love the high-low trend too. And WITH pockets? Does it get any better? Me too! It seems like it would be really flattering to that mama-pooch hehe. Challenge: Find me a cute Maternity Maxi Dress with Pockets! These are great choices. I haven’t found a dress with pockets yet that I like on me but I have a few summer skirts with pockets. Actually, it’s one style that I bought in three colors! It was too comfy to pass up. Oh I am loving that blue one!